If you're looking for a professional way to recognize you employees, our Traditional Recognition Program is a classic. The handsome beveled plaque is made of elegant, rich, rosewood and is complemented by beautiful brass plates. This version of our best-selling program features a handsome beveled plaque in rich rosewood and 12 smaller individual plaques- one for each honoree! We also offer a Traditional Employee of the Month Basic Recognition Program -- click here. 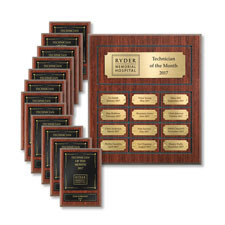 Upon ordering the Premium Service, you will receive your Annual Plaque and all of your Individual Awards upfront. 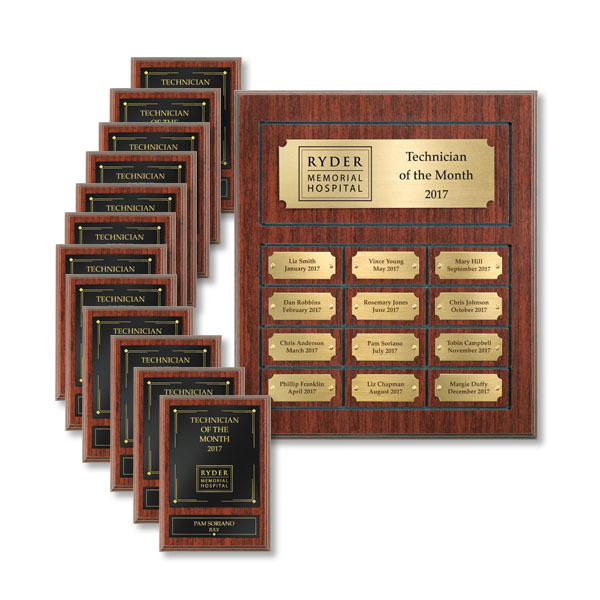 Every month, when you submit your recipient’s information, we will send out engraved nameplates for your Annual Plaque and Individual Awards. Free Engraving: Every month just call, fax, email or go online to provide your recipient’s information, and we will engrave and ship your plates within 5 business days.